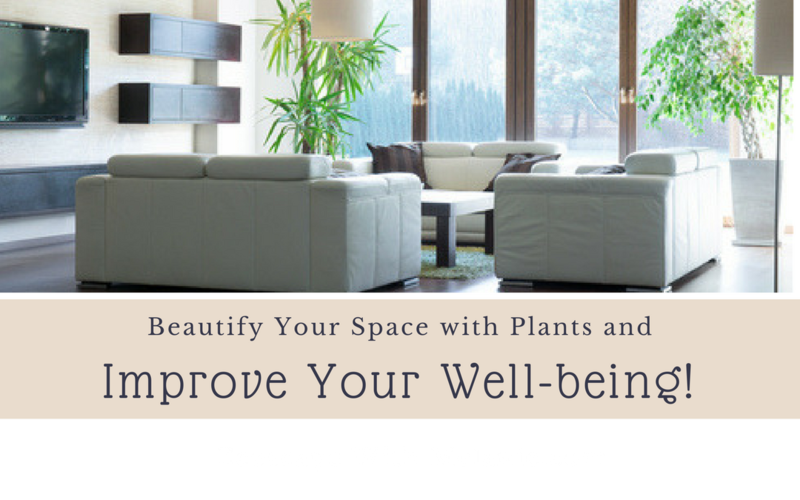 Ecoscape With Melanie | Helping you grow from yard to garden! Today I am sharing a personal story of transformation. My purpose in sharing is to spread the word about how I overcame chronic migraine so that others living with that pain might also find relief. I started having migraines in childhood. I’m now 56 (as of 2019). For most of my adult life, I had headaches almost daily and had migraines at least twice a week. Migraines often had me down for two to four days at a time. I was completely preoccupied with “trying not to have a migraine”. Due to my focus on this and other fear-based thoughts, I was living in an almost constant state of stress, anxiety, and overwhelm. In spite of my state of un-wellness, I was very driven. I believed that if I could just get well, make more money, and “get my life in order”, I would be ok. I was obsessed with this idea. My belief was that when I accomplished this, then I would relax more and have more fun. I didn’t realize it at the time, but by thinking this way, I was giving up much of my joy in living each day, and trading that joy for regret about the past and anxiety about the future. With regard to wellness, I believed that if I felt better, I would be able to take care of the rest. I believed deep down that not feeling well most of the time was not normal for a fairly healthy person (which I thought I was at the time). I just refused to accept that my life had to be that way. I believed there must be a better way. I believed there must be an answer out there for me, and I was determined to figure it out. Over the years, I tried all of the following and probably more: yoga, massage, aroma therapy, nutritional therapy, stress management techniques, personal counseling and group therapy for anxiety and stress management, herbal remedies, hormone testing, several medications including preventives for two years, and of course avoiding many foods thought to possibly trigger migraine. In 2009, I took a food allergy test. Eggs, dairy, gluten and wheat were listed as “significant allergens”. Many other items were listed as high sensitivities. I was so excited after hearing the results because I thought surely this was going to be my “answer”. I already had been avoiding a long list of foods commonly considered “Foods to Avoid for Migraine”. After making these dietary changes, I did have significant improvement. I went from decades of having headaches nearly every single day to having several pain-free days in a week. In 2011, I was laid off from my full time job which I had held for ten years. I was certain that having more time to rest and properly care for myself and eliminating work related anxiety was going to be the end of the chronic migraines. Nope. In 2014, I hit my lowest point. In spite of trying several migraine medications (including preventives), making many changes to my diet and lifestyle, and working for five years with a chiropractic neurologist (who took a holistic approach to healing), I was still having over 17 migraine days per month with “regular” headaches on most other days. One would finally stop, and another could begin less than 12 hours later. I was absolutely miserable much of the time, and I felt hopeless. I had lost my desire to live. I didn’t see any point to my life. I could do very little to help anyone else. Family and friends couldn’t count on me to be available to them or keep my commitments. I didn’t want to be a burden, and I was exhausted. In August of 2015, my daughter and her husband Cliff took me in. This gave me an opportunity to rest and focus on my wellness without having to support myself financially. This was very significant in my healing journey. I believe I wouldn’t have made the progress I have without their help. Thank you so much Jessica and Cliff. Also in 2015, my daughter suggested I check out a website called MyMigraineMiracle.com. As I read through the website, I felt in my heart that Dr. Turknett was being truthful, and I trusted him. I purchased Dr. Turknett’s book, “The Migraine Miracle”, joined the Facebook group, and joined Migrai-Neverland (subscription to all Migraine Miracle resources). I felt hopeful again! Fast forward almost three years, and I’m doing better than ever. I now have only about two migraine days in a month, and I believe I will continue to improve. The daily headaches are gone. No more chronic anxiety. No more chronic insomnia. I no longer take pain (or preventive) medication for migraine. I exercise at least five days a week. I now jog almost daily. I no longer have any joint pain. I also have a much better energy level, and renewed sense of enjoyment from eating. I love cooking again, and I’m gardening! At my worst, I was not enjoying food. I had eliminated many foods including beef, eggs, garlic, onions, peppers, tomatoes, and a whole list of other items. I rarely ate out. I felt very deprived. I remember thinking at one point, “I wish it wasn’t necessary to eat in order to live”. I’ve finally come to accept the fact that to a great extent, I created my own reality. I did not believe that I could accomplish my goals, and in many cases, chose not to take the action needed that could lead to change. Therefore, I continued to feel unhappy about my life. For decades I have struggled with the same issues. Somehow, I just couldn’t seem to manage to change myself in spite of all the “learning” I was doing. I was great at taking courses, reading books, and making plans, but what I actually implemented was very minimal. That fact caused me a great deal of internal anguish. I felt I was wasting my life. I believed that I wasn’t capable of changing my life. I thought I wasn’t smart enough, strong enough, or “together” enough to do it. I would admire other people who seemed happy and were making changes in their lives, and I would think, “I want to be like that”. Also, as I already mentioned, I had a terrible problem with anxiety. I would allow myself to totally shut down, and I found it very difficult to get out of it. Anxiety was the worst when I had migraine pain, or when I would feel that one may be starting up. I had an underlying belief that I could not take care of myself. I thought that migraines were keeping me from doing the things I needed and wanted to do in my life: generate more income and achieve my goals. I saw migraines as the problem. What I didn’t know was that there was something I could do about it. A key element of that something is mindset. One thing I learned through the Migraine Miracle program is that anxiety can trigger migraine. I used to think the idea was ridiculous. I’ve now seen it happen and documented it several times while I was in the MM program. So I now know that in my case, my thoughts were powerful enough to trigger a migraine. I also learned that I have the power to stop it. In addition, I’ve learned techniques to shut a migraine down before it completely takes over my physiology! I have made so much improvement. Currently, I am only having about two migraine days per month, so really I’m not losing very much time to migraine. This belief that I held that I had to be migraine-free before I could generate more income and pursue my other goals was another way that I was choosing to focus on fear rather than on the joy and opportunities of the present moment. Another big change I’ve made is that I no longer feel disappointed in myself if I get a migraine. I used to think that if I got one, it was because I had done something wrong related to my self care and migraine prevention efforts. I would emotionally beat myself up over it for days. My goal now is to be happy in spite of the pain. I find my gratitude, and focus on doing something, or just enjoy relaxing. Now I like to keep my focus on the positive no matter what happens in my life. I’m happier than I have ever been, and have a renewed sense of joy in simply being alive. I love my life. I’m so grateful to have the wellness I now enjoy. It is wonderful to feel good and realize, “I don’t have a migraine! I can do whatever I want today”! As I write this in February of 2019, I feel like I am really living again. I love this beautiful world, and I’m so happy for all the great people I have the opportunity to share this amazing life with. One thing I especially love in life is helping other people. I love to connect with another person and meet a need, or simply share time together. If migraine is an issue in your life, please check out MyMigraineMiracle.com and give the program a try. There is nothing to lose, and so much to gain. If you don’t have migraines yourself, but know someone who does, please share the site with them. It could be the catalyst that changes their life. In addition to being an absolutely genuine, and extremely caring and giving human being, Dr. Josh Turknett is one of the rare gems of modern medicine. Dr. T is one of the few physicians who actually practices the true art of medicine. He believes in the Hippocratic Oath: “First, do no harm”, and takes a very holistic approach to healing and wellness. He prefers to identify the underlying cause of a problem, and help the body correct the problem when possible rather than masking symptoms with drugs. As a migraine sufferer himself, he gets it. He knows the impact chronic migraine can have on a person’s life. He has dedicated his career to helping people find their path to migraine freedom without pills. I extend my deepest gratitude to Dr. T and his wife Jenny for all they do to help others slay the migraine beast and transform their lives. Thank you so much for reading to the end. Please give this post a share so that it may reach others who may benefit from this information. If you would like to ask me any questions about my experience using the Migraine Miracle program, please post in the comments below or send me an email using the contact form on this website. 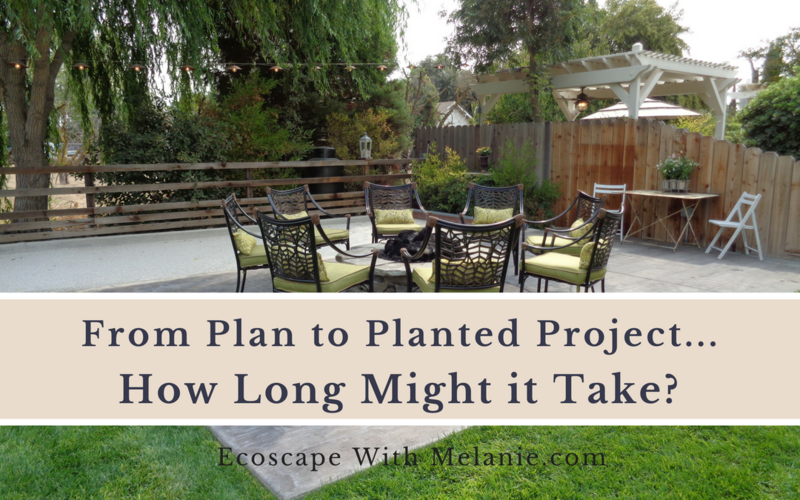 The Landscaping Process: From Plan to Planted Project, How Long Might It Take? Landscaping done right takes some time. Creating a plan and implementing that plan is a process. It doesn’t happen as quickly as it appears on popular home shows you might see on HGTV. There is a great deal of work that takes place behind the scenes of those shows to make those beautiful makeovers happen. It all begins with you deciding that you want to beautify your outdoor space. You may already have a pretty solid idea of what you want, and you have a vision in mind. On the other hand, you may not have a clear vision of what you want, and would like to explore ideas and possibilities. There is a wide range of options for working with various landscaping professionals to create a design plan and install a project. 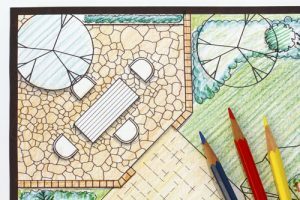 For the sake of simplicity, this article will focus on the example of working with a landscape designer for the design portion of your project, and a landscape contractor for the installation. Some landscape contractors provide design and installation services, so it may be possible that your entire project would be handled by one company. The first step in the landscaping process is usually an On-site Consultation with a landscaping professional. These initial site visits are typically scheduled for one or two hours. Some companies will provide consultations at no charge, others charge for their time. Many will charge for the consultation, and apply the payment to the design plan or the installation if you also hire them to create the plan and/or install the project. One primary purpose of this visit is for you (the client) and the designer or contractor to get a feel for whether you would be a good fit for working together to create a design plan and/or an installation for your project. The designer’s job is to get a clear understanding of what you want, and share information about him or herself and his/her ideas & inspiration for your space so you can get a feel for whether this person’s ideas, personality, qualifications, etc. will be a fit for you and your project. The process often begins with the designer asking you to fill out a client questionnaire prior to your first appointment. Then when you meet for your consultation appointment, you’ll do a walk-through of your yard together. Typically, you’ll discuss your “Must-Have” items and “Wish-List”. The designer will share ideas on ways to incorporate some of your requirements, and present some plants that may appeal to you and work well in your project. If after the initial consultation, you like the designer’s ideas and feel the person is a good fit for you and your project, you can request a price for the cost of having that person or company prepare a design plan and/or install your project. Usually at this point, a proposal will be prepared to specify the cost, process and payment schedule that will apply if you want to hire that company to design and/or install your project. Most companies require a deposit at this point before moving forward. Typically, once a deposit is received, the next step in the process is the creation of a Conceptual Plan. A Conceptual Plan is basically a rough draft drawing of possible ideas for your project, and is the first step in putting the vision for a space onto paper. Depending on the size of your project and your “Wish List”, more than one Conceptual Plan may be prepared. To gather information needed to prepare the Conceptual Plan, an appointment will be scheduled to evaluate the site, and take measurements and photographs. How quickly the Conceptual Plan can be prepared depends on the size of your project, the complexity of the features you want, and the availability of time in the designer’s schedule. Conceptual Plans might be completed as quickly as five days. Once the conceptual plans are completed, an appointment will be scheduled to review them. As mentioned, the conceptual plans are a representation of a general vision for a space that illustrates the major features and requirements expressed by the client. During the Conceptual Review, changes and adjustments are made if needed. The Conceptual Review is the best time to request any changes to the plan. Changes requested after the Conceptual Review appointment may delay the completion of the final plan, and may add to the cost. This appointment usually takes about an hour. Assuming the client is happy with the conceptual plan, and wants to move forward, the final plan(s) will be prepared. The amount of time it may take for your final plans to be completed depends on the size and complexity of your project. Depending on the features of your project, plans for things such as lighting, irrigation and drainage, and construction details may be needed in addition to the planting plan which only shows the placement of the plant material. Once your project is scheduled, it may take anywhere from 25-35 hours over a period of two to four weeks for all the plans to be completed. Once you have a design plan, your project needs to be installed. Depending on the size and features of the project, there are a few options you may consider for installation. If you are only adding or changing plants in an existing landscape, your plan is probably very simple in terms of landscaping. You may choose to do the work yourself, or hire a gardener to do it. For a small planting project, the work can probably be done in one or two days. 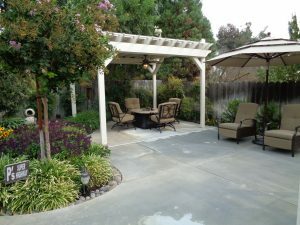 Larger projects which may include the construction of new features such as planter bed borders, sidewalks, patios, irrigation, lighting, etc.should be done (and may be legally required) to be done by a professional landscape contractor unless you have the skills and abilities to do the work yourself. Check with your city and state for regulations pertaining to landscaping projects in your area before starting any project. If your home is bound by the regulations of a homeowner’s association, be sure to check their rules also. HOA’s can be very restrictive, and they can require that your entire project be removed if they determine it is not in compliance with their regulations. Also, like other home improvement projects, a landscaping project may require a permit. 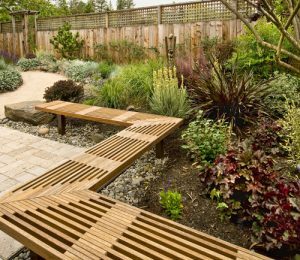 Once you have your plan in hand, you can begin collecting bids from landscape contractors for the installation of your project. A landscape contractor holds a C-27 landscape contractor license, and is a landscaping professional. A general contractor may be able to legally perform landscape work, but is probably not a landscaping expert and may not have landscaping experience. I always encourage people to collect bids from at least three contractors. Your new landscape is an investment. The design plan is just one part of the process. The plan is a drawing of a vision. It is the contractor who will turn that vision into a physical reality. You want that job to be done with professionalism and quality of workmanship by a person with landscaping experience. You also want to be sure that company is licensed and properly insured. Take the time to meet and interview several contractors, verify references and licensure, collect bids, and choose wisely. Generally, it could take anywhere from one to five days to get a bid from a contractor once he or she has seen your property and received a copy of your plan. When you have collected all the bids you want, compared them, and chosen your contractor, let that person know right away so that you can accept the bid (sign the contract), and get your project on his or her calendar. It is not uncommon for quality landscape professionals to be booked several months out. The length of time it takes to install your project will depend primarily on the size and features of your project. Your contractor will provide you with an estimated time of completion. Your contractor will let you know when your job will begin and about how long it should take to complete. Be aware that there are factors that may delay the completion of your project that the contractor cannot control. Such things may include rain, frozen ground, plants or other materials that may need to be special-ordered, materials that were ordered, but in error are not delivered when promised, etc. Also, landscaping projects can be similar to other home improvement projects in that other problems may be encountered that were not expected. Power Up Your Landscape with These Edible & Herbal Superstars! Lemons have a relatively low heat requirement in terms of citrus, and do very well near the California coast. All citrus is frost sensitive. Improved Meyer Lemon is one of the only disease free lemon varieties allowed for sale in California. 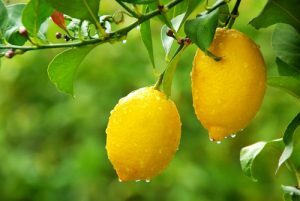 Meyer Lemon can be easily maintained at 6′ x 6′. Lemon trees are evergreen and have dark green glossy leaves. Meyer Lemon is thin skinned, is very juicy, and has a less acidic taste than most lemons making it a great variety for juicing. Lemon is extremely valuable medicinally, and for preparing herbal home cleaning products. Like lemons, orange trees are beautiful in the landscape, and very valuable in the home garden. The orange blossom fragrance is very calming, and oranges are a wonderful source of vitamin C. There are many varieties of oranges that ripen at different times of the year. 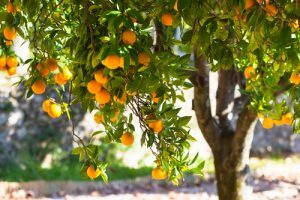 If you love fresh oranges, you might consider having one tree that ripens in Summer, and one that ripens in Winter. All citrus is frost sensitive. Citrus can successfully be grown in containers for years. 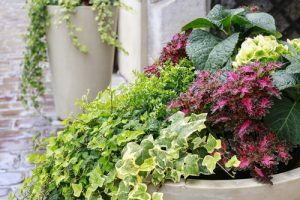 Use a dwarf variety for container planting. Check with a nursery or citrus grower for best varieties for your needs and growing area. Four Winds Growers is an excellent source of information on citrus selection and care. Pomegranates produce a highly nutritious, fruit that is very high in Vitamin C and anti-oxidants, and is usually very expensive when purchased in stores. Many of the juice brands sold in stores have added sugar and other ingredients. 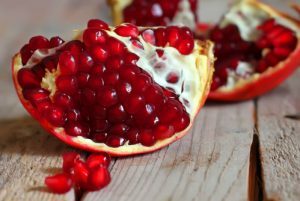 Pure pomegranate juice will be the most expensive. The fruit ripens in Fall, and can be stored for several months in the refrigerator. For this reason, I consider pomegranate one of the most valuable trees to have in the yard if they can grow in your area. Pomegranates are one of those plants that I’ve often seen thriving in spite of neglect. Although they can tolerate considerable drought, trees grown for fruit should receive regular watering. There are many varieties available with differences in tartness or sweetness of juice, and some varieties are better than others for juicing. Pomegranate trees are deciduous, and usually grow as a large multi-stemmed shrub. Pomegranates can tolerate heat and many soils including alkaline. I’ve seen them produce well in clay soil as well. 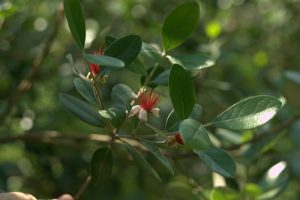 Pineapple Guava is an evergreen shrub or tree that can take full sun. The plants can get quite large (to 15′ x 25′), but can tolerate heavy pruning. These plants are usually grown as large broad shrubs or multi-trunked trees. Flowers and fruit are edible, and attractive to birds and bees. The pretty flowers can be added to salads, and the fruits can be eaten plain or used to make jelly. The plants are drought tolerant, but should be watered regularly if grown for fruit. Improved varieties such as ‘Beechwood’, ‘Coolidge’, ‘Mammoth’, and ‘Trask’ will be self-fruitful. Older varieties will need a pollinator plant nearby. Rosemary is a great culinary herb that also makes an exceptional landscaping plant because it is tough and easy to grow. Rosemary comes in spreading or upright forms, and is usually grown as a large shrub or mounding ground cover. Depending on variety, plants can typically grow to 6′-8′ wide and 3′ tall or more. Rosemary can also be used to create topiaries or shaped into small living Christmas trees which can be used year after year. Rosemary can be grown in full sun, and is a low-water user. The plant tolerates ocean spray, wind, heat, poor soils, and clay. Rosemary is also fire resistant and deer resistant. There are many varieties available with differences in growth habit and size. Depending on where it is grown, it may bloom off and on all year. Most flower in some shade of lavender blue, but there are a couple of pink varieties as well. To save yourself work, and maintain the attractiveness of the plant, be sure to plant it in a location where it can grow to full size without needing extensive pruning to control size. Variety ‘Barbeque’ is very upright and narrow. It grows only 2-3′ wide and up to 6′ tall. This variety would be great for small yards or for creating a natural living screen. Rosemary is attractive to bees when in bloom. As an herb, rosemary is commonly used to flavor meat, pasta, fish, and other dishes, and has medicinal properties as well. Rosemary, like orange blossom, is another plant that makes me feel better instantly just by smelling it. Rosemary has been regarded throughout history as being uplifting and energizing, and has been used to relieve depression, exhaustion, and arthritis. 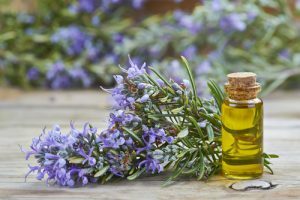 The essential oil of Rosemary is believed to stimulate hair growth, and is an ingredient in many shampoos. Sage (Salvia officinalis) has long been associated with health and longevity. This is the plant referred to in the saying, “Why would a man become sick when Sage grows in the garden”. This is also the herb commonly used to flavor chicken. Some herbal references say that Purple Garden Sage (Salvia o. ‘Purpurescens) is more effective medicinally than the green leaved variety, Salvia officinalis. In the garden, both varieties are easy-care plants growing to about 3′ x 3’ with stalks of purple flowers that are loved by bees and hummingbirds. The purple tinged leaves on Purple Garden Sage will stay through the Winter in Central California. Both varieties can tolerate ocean spray, poor soils, clay, wind, deer, rabbits, and alkaline soil. Salvia apiana is a California native with aromatic silvery white leaves and lightly fragrant white flowers growing on 2′ tall stems. This plant is loved by bees and hummingbirds. The silvery foliage shines in moonlight and provides a great background for dark purple or red flowers. This plant requires very little summer water once established, and tolerates poor soils, heat, deer, and rabbits. It is also considered fire resistant. 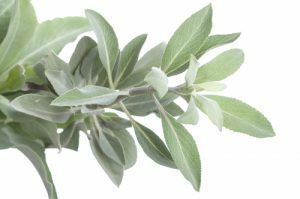 Sacred White Sage has medicinal properties, and is the sage commonly used ceremonially by Native Americans. The plant should be located in full sun. Blueberries are highly nutritious, and given the right conditions, can be grown successfully in the landscape or in containers. Being native to Eastern North America, Blueberries thrive in conditions that suit Azaleas (cool, acidic soil rich in organic matter with good drainage). There are now many varieties available for all areas of the country. Varieties also differ in size of plant, as well as size and sweetness of berries. Because blueberries require specific conditions for fruit production and to keep the plants looking good, I would encourage you to learn about them before adding them into your landscape. 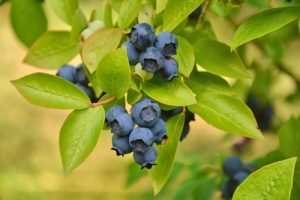 When receiving the right conditions, Blueberry plants look great in a landscape, and are a valuable addition to the home garden, especially if you are gardening with children. I live in California, and our native soil conditions are about opposite of what Blueberries like. However, we do have some Blueberry farms here where they plants are growing very successfully in the ground. I first tried growing Blueberries in containers rather than planting them in the ground. Ours have been in barrels for two years now. The first year, we hardly had any berries. The second year was great. The bushes were beautiful and loaded with berries. Blueberries can remain productive in containers for several years, and I know some people who have had some very impressive results here in California. Lavender is water-wise, very beautiful, loved by bees & butterflies, and is very useful. Lavender has calming and antiseptic properties as well as a wide variety of medicinal uses. Lavender flowers are edible, and can be used to flavor ice cream, cookies, and pastries. 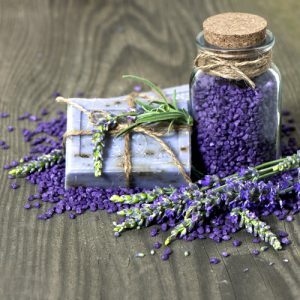 Lavender is commonly used in sachets, perfumes, soaps, and baby products as well as cleaning products, and as insect repellents for pets. Lavender is easy to grow, especially in hot, dry climates. Lavender can thrive in heat or cool climates, and requires little to no fertilizing. The most common causes of death or poor growth of Lavender are over-watering, over-fertilizing, frost, or humidity combined with heat. There are many varieties available with differences in size of plants, flower color, and strength of fragrance. Some varieties have been developed with better tolerance to certain environmental conditions such as humidity. Lavender needs full sun. If you are wanting to grow Lavender for medicinal or herbal use, plants with variety name beginning with Lavandula angustifolia would be best. Oregano is a valuable herb that also makes a great landscape plant. Most of us are familiar with Oregano as one of the herbs that gives the sweet taste to Italian pasta sauces. Oregano is one of my essential cooking herbs. I find the flavor kind of addicting like Basil and Dill! 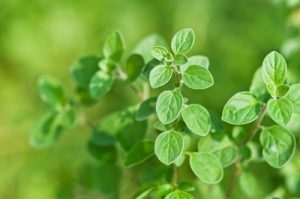 I also love oregano as a landscaping plant because it thrives in heat, is a low-water user, and grows only to about 2′ x 2′. It is also a butterfly attractor, and bees love it. Oregano can be used as a small ground cover, in rock gardens, and cascading over retaining walls. Oregano has really pretty flowers that can be cut and dried. 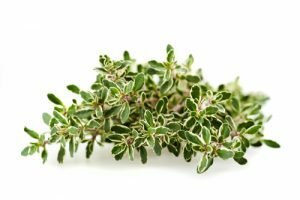 Thyme is another popular culinary herb that makes a great landscaping plant. 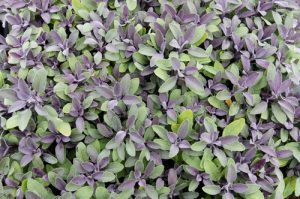 The small mat-forming varieties make an excellent ground cover for small spaces. Most varieties prefer full sun, or afternoon shade in hot summer areas. Elfin Thyme has tiny leaves and only grows to 2″ x 5″ wide. This variety is a low-water user, and does not produce flowers, so it would work well between stepping stones. There are many varieties with differences in scent, flower color, and growth habit. My favorite is Lemon Thyme Thymus x citriodorus ‘Aureus’. The plant grows 1’x2′, and has grayish green leaves splashed with gold. Leaves have a lemon scent and flavor. The medicinal and nutritional qualities of Garlic make it essential in the family garden. Garlic is one of the most valuable plants on the planet. Garlic has several medicinal qualities, and is an essential cooking herb for flavoring meats, dressings, sauces, and many other foods. Garlic can be used in home made pest repellent and pest management recipes for the garden, and is said to be a good companion for roses. 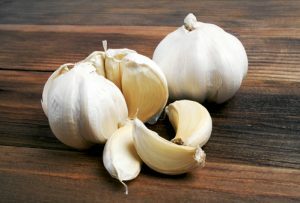 Fresh Garlic is far superior in flavor and nutritional quality than Garlic typically found in stores. In mild winter areas, plant in Fall for early summer harvest. If your winters are cold, plant in early spring. Aloe is another of the most medicinally valuable plants on earth, and it is not difficult to grow in relatively frost-free areas. 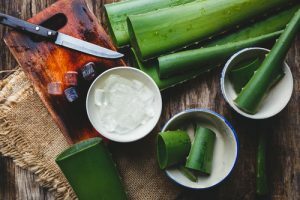 Pure, raw Aloe Vera juice and gel can be expensive to purchase. If you are using Aloe juice on a regular basis, you might consider growing your own. You can’t get fresher than harvesting from your own plants, and by growing your own, you know it is 100% pure and contains no chemical additives. It takes several years for Aloe plants to grow large enough for harvesting significant amounts of gel or juice. A couple of years ago, I was growing my own plants, and harvesting the gel and juice. My plants were doing very well, and I was amazed at how fast they were growing. I had them all in large containers filed with soil from the yard. They were receiving mostly indirect light in a spot that received sun around noon and maybe a little again in late afternoon. Do your research on how to properly harvest, store, and use the gel and juice. There is an irritating and fowl-tasting sap in the leaves that must be drained prior to juicing. Aloe is frost sensitive. Borage is a beautiful annual plant I fell in love with the first time I saw one. I’ve never grown it myself, but would love to give it a try. The following is information I’ve learned about the plant through books and other resources. Borage grows to about 3′ x 2′, and has bright blue flowers, and fuzzy green leaves. Borage doesn’t transplant well, so direct seeding in late spring is the best way to get it started. The plant will self-seed, so you should be gifted with new ones each year! 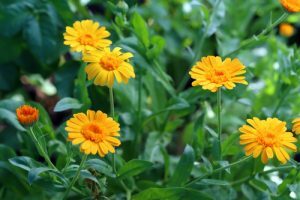 According to the Sunset Western Garden Book and other herbal references, the leaves and flowers are edible. Flowers are often used in salads. The plant also has a wide variety of herbal uses. 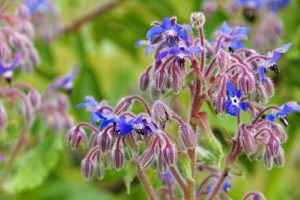 Borage is know to stimulate the adrenal glands, reduce stress, soothe cough, and more. Flowers can be used in fresh arrangements. The plant tolerates poor soil and some drought. It needs afternoon shade in hot summer areas, and needs frost protection. Seeds are commonly available in retail stores, nurseries, and online sources. Like Calendula and Borage, the sight of Sunflowers always bring me joy. 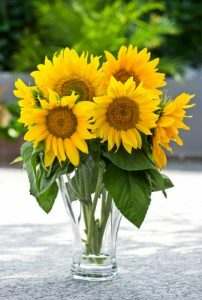 Sunflowers are among the easiest plants to grow. They are often found growing wild along roadsides and open areas. There is a wide array of varieties available in a wide range of colors, sizes, and growth habit. Some are annuals, and others are perennials. Sunflowers are great in the family garden and child play areas. A friend of mine planted some of the giant ones in a half-barrel with Zinnias in front, and they looked great. Many varieties make great cut flowers, and birds love their seeds. Sunflowers bloom in Summer and Fall, and need full sun. Most non-native varieties need regular watering. Plant in early Summer. Take care, slow down, and enjoy! 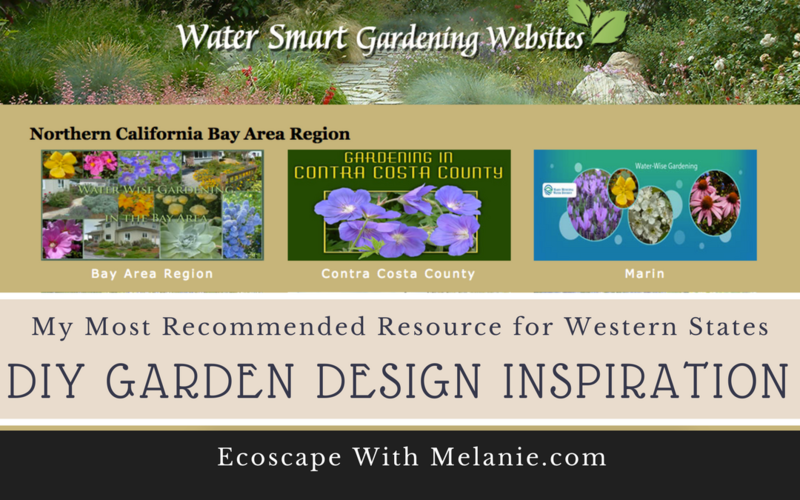 My Most Recommended Resource for Western States DIY Garden Design Inspiration! 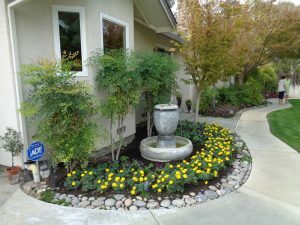 Are you considering a new landscape installation or re-design? Whether you are planning to DIY or hire a pro to complete all or part of the project, one of the first things you’ll need to do is to get a good idea of what you want. Garden Soft gardensoft.com created the professional plant database and online plant presentation program that I use called Plant Master. The Water Smart Gardening Websites are a free resource available to the public. The websites assist with plant selection, provide amazing examples of beautiful landscapes, as well as links to many excellent resources for irrigation and garden planning. 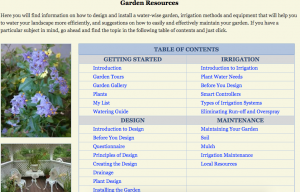 The reason the Water Smart Gardening Websites are one of my most recommended plant selection resources is because they are so easy to use, and they provide many of the same plants, photos, and features I use in the professional program that I pay for. 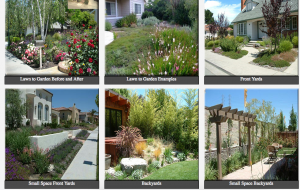 As a user of a Water Smart Gardening Website, you can browse photos of real life landscapes organized by category such as Front Yards, Back Yards, Lawn Alternatives, Low-maintenance Landscapes, CA Native Gardens, Parking Strips, Water Features, and many more! Photos of plants are also organized by categories such as Plants That Attract Butterflies, Ornamental Grasses, Unusual Foliage, etc. 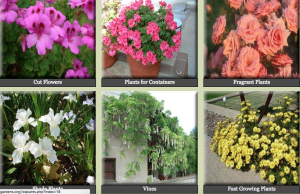 The plant database is searchable by common or botanical plant name and has a guided search feature to help you choose plants to meet your interests or specific growing conditions of your yard. As you search, you can save plants you like and create your own printable plant list. Slow down, take care, and enjoy! Beautify Your Space with Plants and Improve Your Well-being! 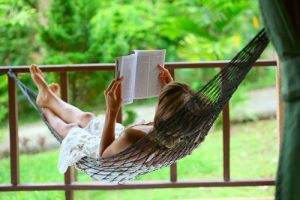 Are you finding it difficult to relax and quiet your mind? Perhaps the state of your personal space has you a bit on edge. We all need some personal space. Having a space we can consider personal where we can unwind, recharge our energy, and express our individuality is good for our health and happiness. Even if we don’t realize it, our surroundings have an impact on how we feel. We all need some personal space, and if our space is cluttered, dirty, or just plain ugly, that can cause stress. What we see day in and day out is going to influence how we feel. One of the simplest things we can do to improve how we feel on a daily basis is to beautify our personal space so that being in it feels good to us. Transforming a space to one of positivity may not necessarily have to be expensive or a huge undertaking. Start small with perhaps one room of your home or just a section of a room such as your office space. The idea is to create a space that can be your own personal place of tranquility. An inexpensive first step may be to simply clean it up. A good cleaning can often make a huge difference. A clean space is calming and inviting. Nothing like a dirty kitchen to squash our desire to cook a meal! 🙂 Self-care is key to our health and happiness, and sometimes finding our way to wellness involves removing things from our lives that don’t contribute to our happiness and well-being so that we can focus on the things that do. If you are having difficulty cleaning because you are overwhelmed by clutter, remove anything you don’t absolutely love or that doesn’t serve a purpose in your life right now. Make a place for everything you are keeping, and give away the rest. Once clean, one way to quickly and easily beautify a space is to add living plants. Plants not only help clean the air, they provide instant beauty and connection to the natural world. Also, because they are alive, caring for them can provide a special sense of fulfillment. 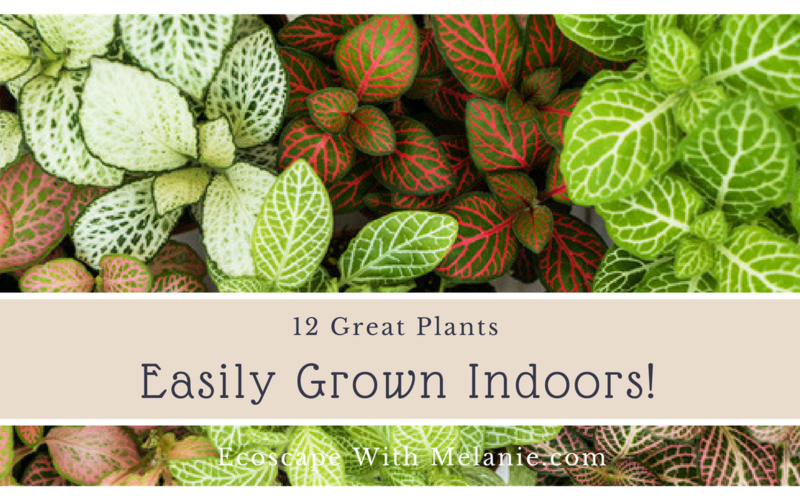 If you need a new hobby in your life, growing indoor plants might be fun for you. When I’m decorating a room, I place my plants first because they have to have adequate light in order to thrive. Other decorative items can be used in spaces that don’t get the best light. Prime space for many indoor plants is right in front of a window that gets good morning sun. Strong afternoon sun might be too much for some plants so you’ll need to keep an eye on them, and move them if needed. Adjusting the light by closing blinds in the afternoon during summer may be an option. There are many plants that can grow in the low light conditions typical of many homes and offices. If you don’t have space right in front of a window, work your way back from the windows, and look for other available spaces that still get some sunlight. The farther away you get from windows, the less natural light there will be for your plants. In these areas, you will need to use plants that can tolerate low light conditions. When deciding on where to locate plants, look for empty spaces that could use some color. Trees or other large plants soften the look and feel of a room, and can be used to fill corners and other large spaces that have good light. 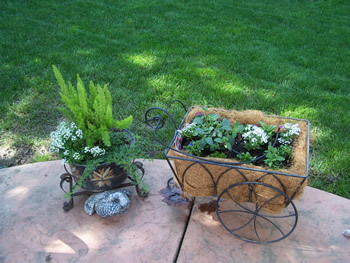 Several smaller plants can be placed around large ones to create an attractive grouping. Small potted plants can be used on table tops and desks. 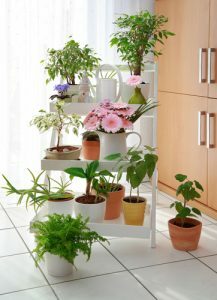 Trailing plants can be placed on the top of bookshelves, wall units, or elevated plant stands. Avoid placing plants on top of or right next to televisions, computers, office machines, or other electronic devices. The electro-magnetic energy given off from such machines is not good for plants, and it can also be a safety hazard when watering especially if children help water plants. There are many attractive plant stands available now that can accommodate a good number of plants. They are available in a variety of styles, shapes, and sizes, and can be used in corners or directly under windows. Some are lightweight and easily portable or come in sets of multiple sizes that nest together for compact storage when not in use. Yard sales, thrift stores, and consignment boutiques are good places to find plant stands, pots, and baskets at bargain prices. Many of these plants are commonly available at plant nurseries, garden centers, or even grocery stores. Use the list to help you determine which plants might be the best fit for you and your space. Tip: Take some photos of your room with a few close ups of the various locations you are considering placing a plant. Bring your photos and your list with you when you shop for your plants. Your photos will help you visualize the plant in your space. You might also want to take some measurements. For example, if you want a rectangular plant stand to go under a window, you’ll need to know how large it can be to fit the space. Also measure the distance from the floor to the windowsill. The plant stand must be tall enough so that your plants will sit above the window sill, otherwise they won’t get light. If you’re shopping at a nursery or garden center, these items will also help the salesperson better assist you in selecting plants, pots, or other items to meet your needs. I would love to see your before and after photos, and hear about how your project worked out. Please share in the comments below. Plants add quality to our lives on so many levels. Indoors, they soften the environment, add living beauty to a room, and provide us with connection to the natural world. All of the plants listed here are easy to grow even for beginners, and most are commonly available at nurseries, garden centers, and maybe even grocery stores. May every family enjoy the presence of an Aloe plant! 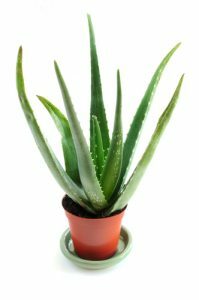 Aloe is one of the most medicinally valuable plants on the planet, and it is super easy to grow indoors! In addition to being spiky, bold & beautiful, you can’t beat fresh Aloe gel for minor burns on the skin. Aloe is a succulent plant that can hold water in its leaves for long periods of time. Allow the soil to dry completely between waterings. This may mean watering only every two or three weeks. Jade is amazingly resilient, and does not require frequent watering. This is another plant that should be allowed to dry completely between waterings, and so may need water only every two or three weeks. If the leaves fade and start to shrivel, it has gotten too dry. With thick stems and succulent light green leaves, Jade produces a profusion of light pink flowers off & on from Fall through Spring. Indoor plants may not flower if they are in a low-light location. Jade can be kept small by keeping it in a small pot, and pruning its fast growing shoots. These plants can get quite large and heavy when grown outdoors or in large pots. I’ve seen them as large as 6′ tall and half as wide. Jade works nicely on the patio, but must have afternoon shade and protection from frost. There are now many new varieties of Jade with interesting textures, flower colors, and growth habits including dwarf varieties that would be ideal for indoor or container growing. Jade is sometimes used for Bonsai as well. This is another plant that should be allowed to dry completely between waterings, and so may need water only every two or three weeks. If the leaves fade and start to shrivel, it has gotten too dry. The leaves should be smooth and plump. Jade is highly toxic to dogs. 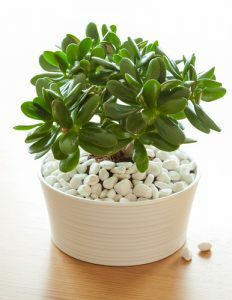 This plant is very similar to the common Jade plant in appearance and growing requirements, and is sometimes sold under the name of “Miniature Jade Plant”. Portulacaria afra has thick reddish brown stems and fleshy green leaves like Jade, but is faster growing and more loosely branched. Portulacaria afra is also available in a variegated form that has green and white leaves. This is a very interesting, beautiful plant that grows into a broad bush or small tree, and provides nice contrast in texture when grown with other common houseplants. It is also a fine specimen on its own. Having a small root system and being drought tolerant, this plant also makes an excellent bonsai specimen. You like minimalist decor? This is your plant! There are so many varieties of Peperomia that I love! They come in a wide selection of varieties with vast differences in form, leaf color, size, and textures. Most have small root systems so they will stay small, and not require frequent re-potting. 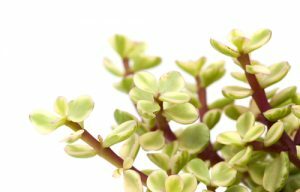 Generally Peperomias can hold water in their leaves and stems so if you forget a watering, they are likely to be fine. Peperomias do well with bright light. An east facing window or one that could be shaded in the afternoon would be ideal. 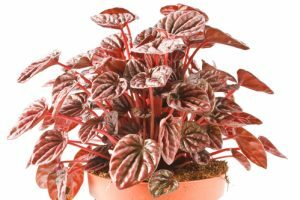 A couple of my favorite varieties include Peperomia c. ‘Jeli’ – upright growth with bright green & white leaves, and Peperomia caperata which has thick dark green leaves with deep fissures that provide interesting texture. Another beauty is the Watermelon Peperomia (Peperomia argyreia). Its leaves have green and white stripes that look like a watermelon. If you don’t find the exact variety you may be looking for, there is likely to be one by a different name that is very similar in appearance. This beauty will tolerate neglect and low light, and comes in many varieties with differences in leaf markings. Leaf color of variegated varieties will look best with bright light. This plant is a succulent, and has stiff upright leaves with sharp points on tips so take care when choosing location. Allow plant to dry between waterings. This plant can remain in the same pot for many years. Some people say this plant loves being potbound. This is another plant that is very forgiving, and would be a good choice for beginners or travelers. It may only need watering every two or three weeks. English Ivy is an evergreen vine that comes in many varieties with different leaf shapes and markings. All are easy to grow. The miniature leaf forms are the best for use as stand-alone plants, topiaries, or as fillers with other plants in potted arrangements. Keep soil evenly moist, and avoid full sun. Some of the prettiest varieties include Hedera ‘Needlepoint’ which has very pointed leaves that will stay small, Hedera ‘Glacier’ which has white edges, and Hedera ‘Teardrop’ which has very pretty heart-shaped leaves. English Ivy is easily grown from cuttings. 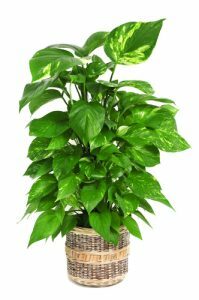 Pothos is probably the most popular houseplant in existence. They are very forgiving. If you are just getting started with houseplants, Pothos is a good one to try. 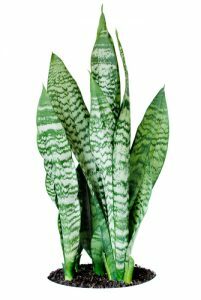 This variety has green leaves with white marbling. Leaf color will be best in bright indirect light. Pothos can be grown on tabletop, climbing, or hanging. These are often seen in restaurants climbing all along the ceiling. Several varieties are available with differing colors of leaf variegation, and they are easy to propagate from stem cuttings. All of the plants listed above as hanging plants can also be used as tabletop plants when young or if kept small enough with occasional pruning. You can also place them on an elevated stand or shelf if you don’t want to use a hanging basket. 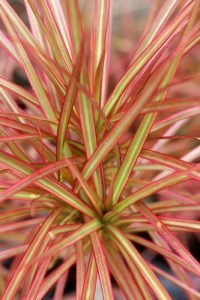 This is a very showy, drought tolerant palm-like plant with red, green and cream striped leaves. It looks awesome when backlit by the sun, and is great for grouping with other plants. This would be a fine tree to showcase against a wall with night lighting. They are not fast growing so buy one that is already full and bushy. These plants can be quite pricy purchased large, but once you have one, they are easy to propagate – a plus if you’re one who likes to play with plants! Your plant will need to be pruned occasionally to keep it full and bushy. If a stem becomes too tall and bare, cut it off at the desired height, and new shoots will soon appear. You can make stem cuttings from the branches you prune off, and start a new plant with them. Just cut the stem into about 3-4″ lengths (remembering which end is down), and place the cuttings (top end up) into a fresh pot of houseplant potting mix. Keep the planting mix evenly moist, but not wet. These new plants make nice gifts for plant lovers, or multiples for yourself! Every time I see one of these, I feel happy inside! This beautiful tree looks lovely all year, and makes a great living Christmas tree. The foliage is soft and fern-looking. Norfolk Island Pines can grow to over 100′ in their native environment, but will be kept small when grown in a pot indoors. So don’t transfer it to the yard unless you have ample space for it! Japanese Aralia is a bold, tropical looking bushy plant that can get quite large. They are great for instant beautification! They also work well on shaded patios, but will need frost protection in winter. Variety ‘Moseri’ has a smaller compact habit, and ‘Variegata’ has leaves with golden yellow or creamy white edges. 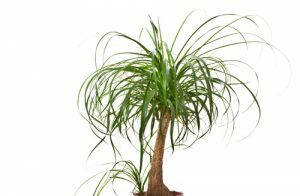 Considered nearly indestructible, the Ponytail Palm adds instant interest to any room. These plants require very little water, so would be ideal if you travel often. Plants are sold in a variety of sizes from tabletop to tree size. As they grow, the leaves will get longer, and the plant may need to be placed on an elevated stand so that its fountain-like leaves can hang naturally. These plants do well in bright light. Outdoors they can grow in full sun. 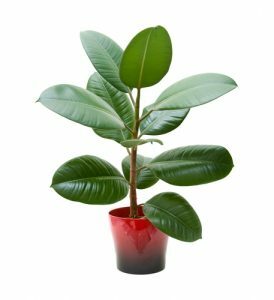 The Rubber Tree is one of the easiest trees to grow indoors, and can tolerate less light than most large houseplants. 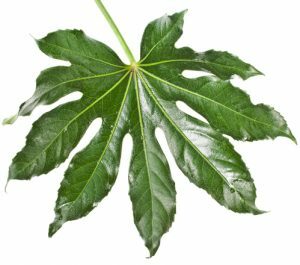 The plant has smooth thick dark green leaves that can grow to 8″ long or more. The new leaves unfold from rosy pink sheaths. Rubber Trees can grow up to 8′ tall, and they can be kept smaller if needed by pruning tall shoots. There are several varieties available with differences in leaf coloring. Avoid using leaf shine products on these or any plants. They can interfere with the plant’s ability to breath. Just wipe the leaves with a dry or damp cloth. When you dust your furniture, dust your plants. If you spray these with water occasionally to clean them off, dry the leaves with a soft cloth or there will be water spots left behind. Choosing plants for a landscape plan or even a small garden project can be overwhelming. There are so many plants! It is easy to find examples of landscapes and plants we love, but how do we know that the plants we like are going to thrive in our garden? There are many factors to consider when choosing plants, and if you want your plants to be low-water users, developing your plant list can be challenging. When researching plants, we see terms like, “water-wise”, “low-water use”, “drought tolerant”, “no summer water”, “medium water”, “moderate water”, “water regularly”, “keep evenly moist”, “keep on the dry side”, “let dry between waterings”, “let dry somewhat between waterings”, “deep and infrequent waterings”. Seriously?! How do we know what these words really mean in terms of how to choose and water our plants? This is like trying to figure out how much light a plant needs: low, moderate, high, bright, indirect, part sun/part shade, half sun/half shade, dappled shade, filtered shade, etc.! Introducing Waterwonk! 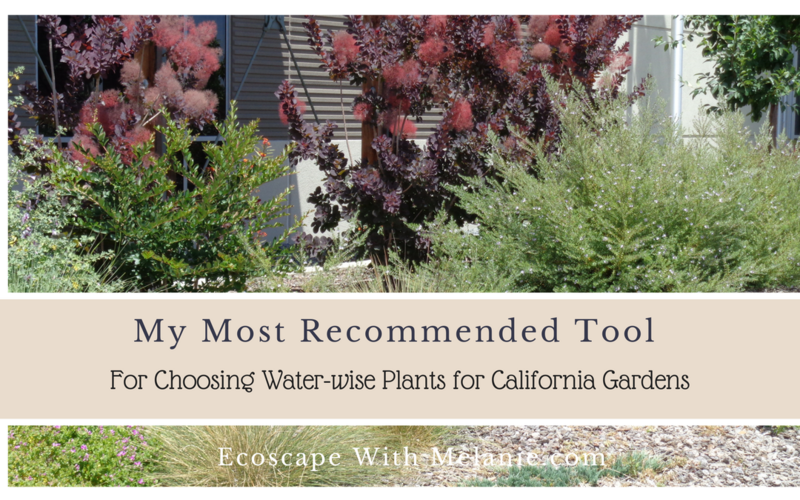 Waterwonk (www.waterwonk.us) is my absolute favorite Must-Have tool I use when choosing plants for a California garden. The water needs of any given plant will vary depending on the climate region where it will live. To make sure the plants I’m considering are appropriate for the location, I look them up in the WaterWonk database. WaterWonk is the WUCOLS online California plant database search tool. Water Use Classifications of Landscape Species (WUCOLS) provides a guide to estimating irrigation water needs of landscape plantings in each of 6 distinct California climate regions. WUCOLS was developed by the University of California Cooperative Extension in cooperation with landscape professionals and funded by the California Department of Water Resources. What I love about WaterWonk is that it is so easy to use. You simply type in your city, and the tool will pull your search results from the correct WUCOLS climate region. You can view the entire list of plants appropriate for your region, or you can filter the list by entering other search criteria such as type of plant (tree, shrub, succulent, etc.). You can even select CA native plants only, or plants that require less summer water once they are established. The database also provides clickable links to Flicker photos of each plant so you are able to get a really good idea of what the plant looks like. Enjoy! If you check out the WaterWonk search tool, I would love to hear how you liked it. Let me know in the comments below! 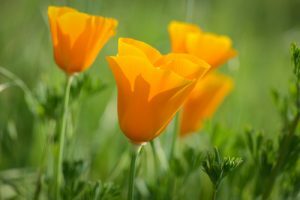 If you’re gardening in a state other than California, check with your county Cooperative Extension Service, or do a Google search to find landscape water efficiency resources for your region. Many water agencies, native plant societies, plant nurseries, and other organizations publish plant lists online. You might start by entering search terms such as “low-water”, “drought tolerant”, or “water-wise” plants for (your city/state). The question I was most often asked while visiting clients as a Garden Consultant was, “Can you design a totally no maintenance yard for me”? My answer often went something like this…”Sure, if you don’t want any plants”! We can create a nice hardscape plan for you, and you’ll never have to mow, weed, or prune again”! (Hardscape includes all the elements of a landscape that are not plant material such as sidewalks, patios, and BBQ pits, etc. Softscape is the plants: lawn, trees, shrubs). 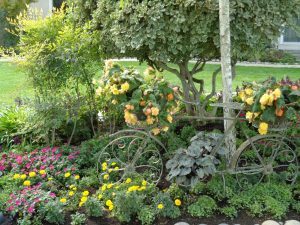 “A well-planned landscape will require less maintenance once the plants become established, which may be up to two years for many varieties. The cost of maintenance for two years should be included in your initial budget for your new landscape. We can definitely create a low maintenance landscape for you by planning for minimal maintenance from the beginning of the design process. However, please don’t plan to do the work yourself just to save money without really thinking it through.” It doesn’t take long for a newly installed landscape to go from fabulous to failure due to lack of proper maintenance. One beautiful benefit of ecological (or sustainable) landscaping is that maintenance is greatly reduced because we design gardens in such a way that we allow the power of nature to do much of the work. 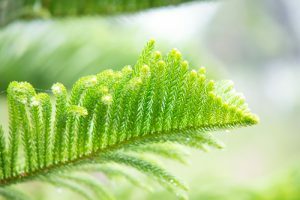 Essentially, we eliminate or greatly reduce labor intensive maintenance tasks by purposefully selecting our design elements and plant material for sustainability, and we let nature put on her show! 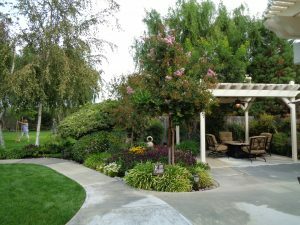 One example of how to significantly reduce maintenance when taking a sustainable approach to landscaping is to eliminate or at least reduce the size of the lawn. The lawn is the highest maintenance element of most traditional landscapes, and typically requires high inputs of products for fertilization and management of weeds and diseases. The lawn is also the highest water use element in most yards. I’m not totally against lawns. I just like to encourage people to consider how much they really need. If you have a lawn now, how often does it get used? If it is rarely used anymore, maybe you would get much more enjoyment out of the space by turning it into a water-wise garden that would attract hummingbirds and butterflies. Think about all the time, energy, and money you could save if you didn’t have to spend it growing a lawn. A hummingbird garden would require maintenance and water too of course, but not nearly as much as a lawn. I love the idea of not having to even think about the lawn every week! If you’re looking to simplify your life, and get more enjoyment out of the space you already have, less lawn might be a good fit for you. 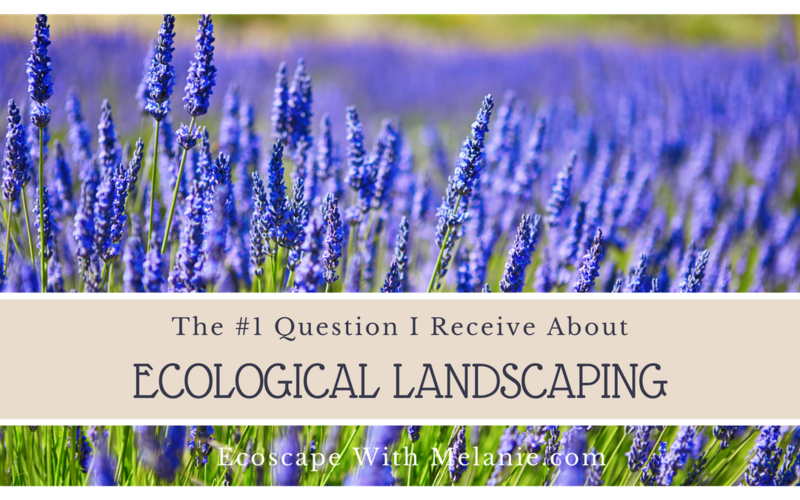 If you have any questions about creating your own sustainable landscape or lowering maintenance in your yard, let me know in the comments below. Your questions will help me choose topics for future blog posts. If you already have an easy care landscape you love, I’d love to hear about it. Please include any details you care to share such as whether you created your own plan or paid a professional to do it for you. Did you do any or all of the work yourself? What went right, what went wrong? What would you do differently next time? Don't miss my best tips on beautifying with plants! You have successfully subscribed! Your first email should be in your inbox now!